Multi Commodity Exchange of India Limited (MCX), India’s no. 1 commodity exchange, and the Mozambique Commodities Exchange (also known as Bolsa De Mercadorias De Moçambique, or BMM), signed a Memorandum of Understanding (MoU) for strategic co-operation on Tuesday, September 20, 2016 in Mumbai. BMM envisages to develop Mozambican commodity markets ecosystem consisting of energy, base metals and agricultural products in an endeavor to deliver better value to the stakeholders. 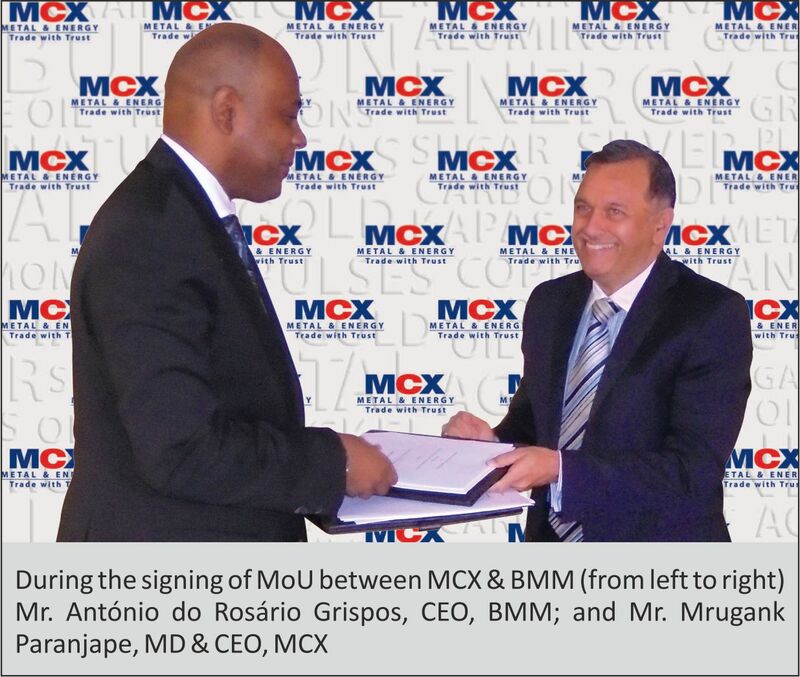 MCX intends to work with BMM to help Mozambique realize its potential behind its resource rich economy through sharing its market and capacity development expertise. The exchanges aim to continue facilitating potential collaboration in areas such as sharing of knowledge, research, experiences etc., which is expected to result in opening up of new avenues of mutual cooperation. ‘‘The choice of MCX, is not only due to its excellent performance in the ranking of the best world commodities exchanges, but is also due to the history of the peoples of these two nations (Mozambique and India), where according to official records last at least five (05) centuries of commercial and social exchanges, which makes all of us a living heritage of this legacy. I am confident that with this agreement the conditions are created for a greater cooperation between the parties, and I would like to ensure that we will do our best to honor it”, Mr. Grispos added. The Commodities Exchange of Mozambique (BMM) was created in 2012 by the Mozambican Government through Decree No. 36/2012 of 17 October, as a public entity, endowed with legal personality, administrative and financial autonomy and is administratively under the responsibility of the Minister who oversees the Trade Sector. BMM started its operation in 2014 and held its first intermediation of agricultural commodities in 2016. BMM is the first and unique commodity exchange in Mozambique. BMM manages silos facilities and warehouses assigned by the Government. In this first phase, BMM trades agricultural commodities and in the near future will transact oil and gas, precious metals and coal. For more information on BMM and its products visitwww.bmm.co.mz.